Good morning. Well this week has been back to winter! Cold, wet, windy and even some hailstones! Cold enough that we lit the woodburner - in June .......!! According to the forecast (oh yeah!) it's supposed to be better today. So fingers crossesd because we are hoping to have a day out today. Certainly yesterday was a vast improvement, but still not June weather! I have seen quite a few of these plant pots around blogland so I decided to make one too. I added a cardstock stand to the back of the plant pot so that it would stand upright. I thought it would make a nice get well card but decided to type "Just For You" on the label then it can be used for something else if necessary. This fits nicely into a 5" x 7" envelope but obviously it could be made smaller or larger. I shall be making some more and try different sizes to see which I prefer. Well I hope everybody is okay, but hugs to those who need them. Love, love,love your beautiful card. The colours, those stunning flowers and the fantastic design. I cleaned out our open fire, filled the space with candles and lights. I keep saying I am not changing it till later .... BUT!!! Fresh Snow on the hills the other day, heating cranked up!! A beautiful card, love it. Have a good day out. 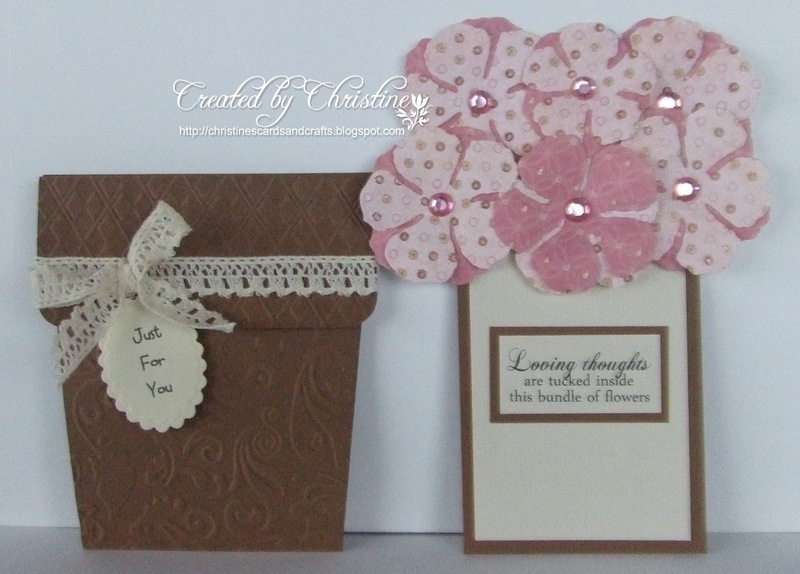 What a lovely card Christine, beautiful flowers and one which could be used for all sorts of occasions. Hope your day out goes well - we have sunshine here at the moment. This is gorgeous Christine. I love the pretty design, the flowers are so beautiful. I hope you enjoy your day out and that you have good weather. It's lovely here at the moment. 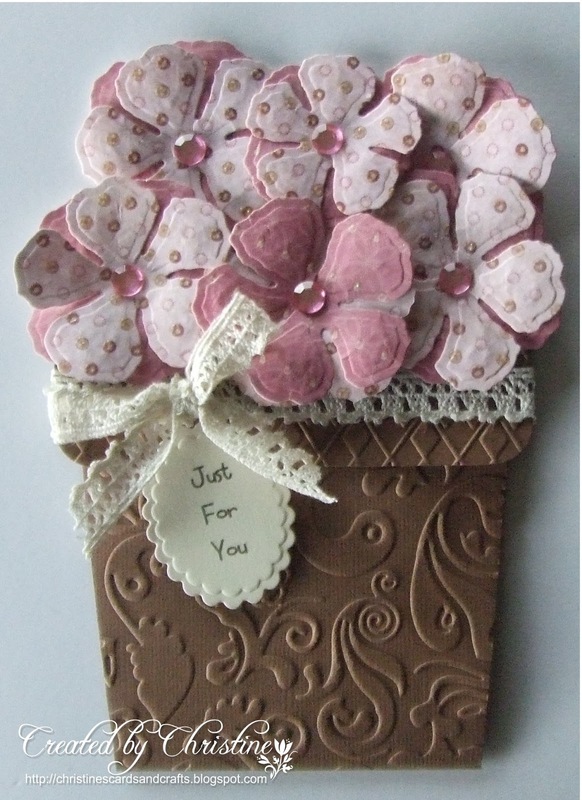 Fabulously pretty plant pot card. Its been ages since I made one but yours looks as if it would post very well. Hope you have managed your day out. We had a lovely day here yesterday and its been lovely so far today. Great card Christine. Would make a great Get well card since they do not allow flowers in the hospitals now. I love this.